Islamic Emirate: Targeting of mosques and madrassas by American invaders!! 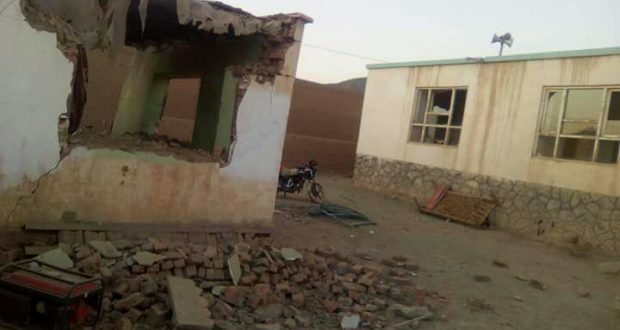 Recently a religious madrassa and a mosque were targeted and indiscriminately bombarded in ‘Narkh’ district of ‘Maidan Wardak’ province in which several pious and innocent students were ruthlessly martyred and wounded in addition to the complete demolition of both mosque and madrassa. This is not a unique and unprecedented incident of its type. For the last sixteen years, no single day has gone in which a mosque or madrassa and its students are not targeted and attacked by the savage American invaders either independently or in collaboration with their internal mercenaries. Indubitably, chasing their malicious and vested economic and military objectives in the region were amongst the main factors which tempted America to invade Afghanistan under the disguise of ‘War on Terror’ but the prominent cause for this brutal and illegitimate military invasion of our homeland was mainly a crusade and religious in nature. And it was explicitly announced by the former American president Bush in 2001 that since they were leading a crusade in Afghanistan, therefore they were definitely going to win it, as it enjoyed the military and financial support of several other crusaders of the modern world. There is one major difference between the illegal and brutal invasion of Iraq and that of Afghanistan. When Iraq was invaded, the resistance movement of Mujahidin remained incessant only in some limited areas and did not enjoy wide range public support either. Secondly, most of those Mujahidin did not belong to Iraq as they had come from other countries to participate in Jihad against the foreign invaders. But it was totally different in the case of Afghanistan. Here the resistance was simultaneously initiated in several areas with great fervor and enthusiasm which spread all over the country in a considerably short span of time. The distinction of a strong and successful resistance movement against the savage foreign invaders which foiled all strategies of NATO and American forces and more than 50% Afghan territory was liberated from their vicious presence, is that here in Afghanistan the ongoing Jihad and holy struggle is guided and controlled by the religious and spiritual leadership of the country, who are deeply rooted in the pious and Muslim masses of this country by enjoying their full and unwavering support both physically and financially. This is the main reason that American invaders and their internal mercenaries could not enervate and encounter the Jihadi spirit and passion of the noble and revered Ulama (scholars) and Sheiks of Afghanistan by drawing a line of cleavage between Mujahidin and the pious masses, though they left no stone unturned to achieve this malicious goal. Both the American invaders and their internal stooges have fully realized that whosoever enjoys the support of the religious and spiritual leaders and the valiant and freedom loving people of this country, cannot be easily pacified or surmounted. Therefore, the American invaders and their NATO and European allied forces fully equipped with modern and sophisticated weapons, could not escape from a humiliating and embarrassing historical defeat despite all their political and intelligence maneuvers. Since the ongoing Jihad and freedom struggle has deep religious and spiritual roots among the Afghan society and masses hence the easiest way for the savage American invaders is to destroy and take their barbaric revenge from the madrassas, mosques and those pious students who are studying there. But it should be realized by Trump and all other brutal crusaders that each and every bomb which hits a mosque or a madrassa, martyring and maiming students, actually enflames the zeal of even tougher resistance and even more sacrifices among our pious and freedom loving people against the savage foreign invaders and their internal mercenaries. New Mujahidin burst forth from each and every village and home with a strong determination and vow to take the revenge of these destroyed mosques and madrassas and the innocent students martyred and wounded there. Therefore, the actual task for the ill-advised and brutal foreign invaders is to reconsider their newly assumed strategy, by finding the answer for the big question, whether this strategy helps them or it deteriorates the situation for them by pushing them towards a final and humiliating defeat inside Afghanistan and the collapse of their colonial powers in the world. As the history repeats itself, we are determined and assured that Afghanistan, the land of pious and freedom loving people, will once again become a graveyard for these modern and brutal invaders. In-sha Allah (God-willing)!!! Carol Anne Grayson is an independent writer/researcher on global health/human rights and is Executive Producer of the Oscar nominated, Incident in New Baghdad. She is a former Registered Mental Nurse with a Masters in Gender Culture and Development. Carol was awarded the ESRC, Michael Young Prize for Research 2009, and the COTT ‘Action = Life’ Human Rights Award’ for “upholding truth and justice”. She is also a survivor of US “collateral damage”.